Today marks Vivian’s (unofficial) first day of the third year of preschool. She is supposed to be starting Kindergarten this year, but us and her teachers decided it would be best to hold her back. We are all hoping this extra time makes the rest of her school years easier. Vivian has been in a special education preschool class for the last two years, the first year going 2 days a week and last year going 4 days a week. This year she will go 5 days a week and be in a “hybrid” pre-k class, with up to 5 students with IEPs (Individualized Education Programs) and up to 10 general education students. Her class will have one special education teacher, one general education teacher and two classroom aides. Before surgery in March, we had a neuropsychological evaluation at Kennedy Krieger Institute, along with a psychological assessment completed by the school psychologist. The results are what spurred our decision to keep her in preschool this year. Although she gained a year in a year in terms of cognitive abilities, she is still behind in many areas and also has severe ADHD, which we are trying to treat. 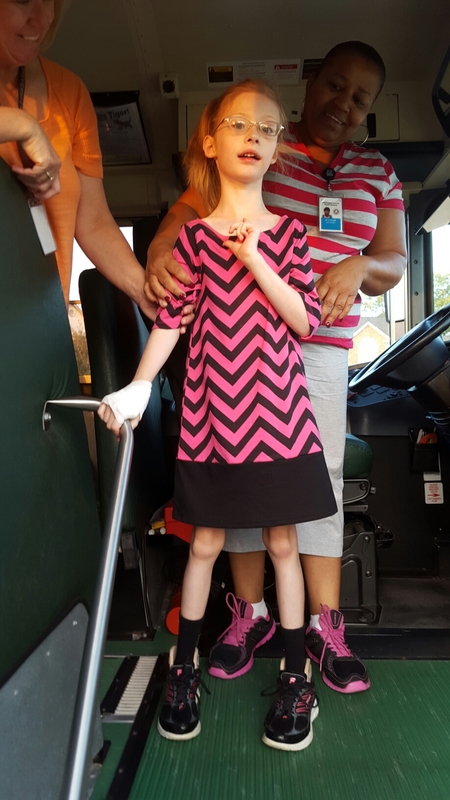 Her “official” first day was Thursday, but the night before she had a bad allergic reaction to a bug bite that landed her in the urgent care, then after that got a second degree burn on her hand. Vivi did go to school for a short time, but I had to pick her up early and kept her home on Friday. We decided to start fresh this morning! I am grateful for everything that has happened in the last few weeks. It was the worst thing to see Vivian in so much pain, but I know that she will benefit in the long run. She’s done so well, but has so far to go. I wanted to post before and after pictures – this will show how miraculous modern medicine is. Before, her curve was at 52%, including a rotation. After, an accurate measurement will be taken within 6 weeks post-op, but you can see the obvious improvement. When we were in the pre-op area, the Anesthetist said that this was one of the most painful surgeries that is performed on children. I’m glad I did not know this beforehand, as it would have added to my already high anxiety level. Luckily, I was able to walk back with her to the operating room. I was with her until she fell asleep, then almost 5 hours later myself and Dave were able to see her back in the operating room, while we waited for a PICU room to be available. 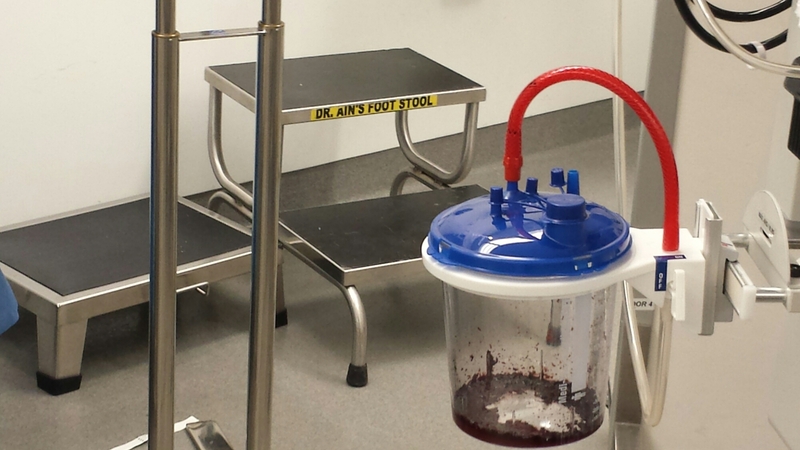 The thing I wanted to see most in this operating room (besides Vivi) was Dr. Ain’s step stool, which I was able to get a photo of. What an amazing man he is. There was a chance she could have magnetic rods “installed”, but unfortunately they did not fit. This means surgery every 6-9 months, instead of a magnetic lengthening. She had come through the surgery healthy, which was all that mattered. 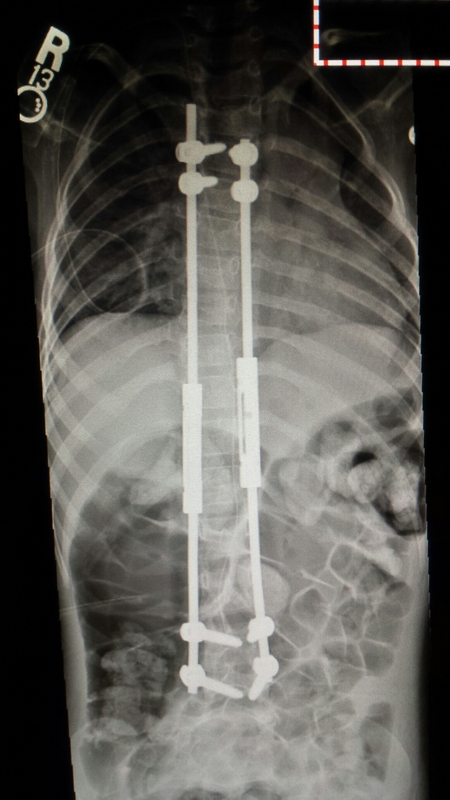 She had two rods and eight screws installed. The bone fusions will complete within 6 months. Trying to get her to not twist and bend her back in the next 6 months is going to be so much fun. There are several things she will need to re-learn: how to bend over and bend with her knees and hips, instead of her back; how to stand up from laying/sitting in the middle of the floor/bed; sitting down to and standing up from a chair. Then of course still working on the skills she has not developed yet such as independent up/down stairs, jumping, running, etc. Patience is a virtue which I am still learning! I am still working on finishing thank you calls/texts/messages/notes, but please know that our family appreciates all the kind words, thoughts and prayers that Vivian has received. They have not gone unnoticed. About 6 weeks ago, I made a phone call. I had to leave a voicemail and the words that left my mouth started with “I’m calling to schedule my daughter’s surgery”. I never thought that I would have to say those words. On February 6, we had an appointment with her orthopedic doctor. I’m not sure whether I was naive or optimistic or just simply ignorant. Whatever the case – we were getting x-rays that would show us the “apples-to-apples” x-rays (standing to standing). Previously, we had compared a sitting to standing x-ray. Her curve (at standing) had gone to around 30%. I honestly did not think it would be close to the 50%, which would be close to surgery range. We had to wait two hours to see the Doctor, after having x-rays done at Hopkins. His Physician’s Assistant said how her curve was very bad, but she wanted to wait until the Doctor measured her curve. Unfortunately, her curve had gotten worse. Much worse. It’s at about 52% right now. Does it hurt her? Who knows. I cannot begin to explain how it feels to not know if your child is in pain. Especially your child that is about 5 1/2 years old. She. Cannot. Tell. Us. She. Is. In. Pain. How am I supposed to do this? She’s having surgery. Her Doctor is going to cut “from her shoulder blades to her love handles”. I have never had surgery before. How can I let somebody cut my daughter? Trust is the answer. I don’t believe I would be as comfortable with this, if I didn’t have the confidence in her surgeon. February 9, 2015 was the day that I called to schedule surgery. On February 6, we were given this option. We do surgery soon and Dr. can get her curve to around 15% after all is said and done. If we were to wait, then final curve percentage would be around 25% or more. I’m pretty sure within 24 hours, probably within 4 hours, we were ready to go forward with the surgery. Surgery is scheduled to start at 11am on Wednesday, March 25. She should be under anesthesia around 11, then Dr. Ain will start the surgery around noon. She will be in Johns Hopkins Pediatric ICU for at least the first 24 hours, then will be in a private room afterwards. Our family is extremely grateful to have been accepted to Johns Hopkins Children’s House during her surgery. We will be going down on Tuesday afternoon, then one of us will be staying with Vivian in the Hospital, while the other stays at the House. Surgery will last at least 5 hours from start to finish, and I will keep everyone informed in the mean time. Last July I applied for a grant that would be the first bit of assistance Vivian has ever received. In order to prove eligibility, I had to get a letter from her doctor stating how she was eligible as a child with developmental disabilities. 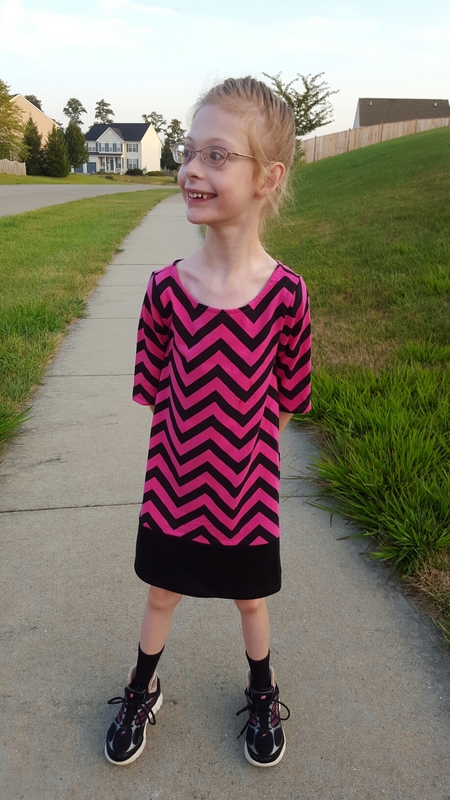 I called the agency to clarify and I was asked if she had Down Syndrome. No. Does she have Cerebal Palsy? No. Does she have Autism? No. I was told she may not be eligible because she doesn’t fit into one of those diagnoses. I then went on to explain more about Vivian and was told that if the letter contained the diagnosis that she had a permanent intellectual disability, then she would meet the criteria. Let me tell you how great that felt asking her doctor to include that in her letter. She ended up getting the grant (after being randomly selected and me having to appeal, based on an employee’s error). In September we scheduled a neuropsychological test for Vivian for next Thursday. We had seen a Developmental Pediatrician at Kennedy Krieger Institute and this test was referred by her. The purpose is to see where she truly lies in terms of her cognitive ability. 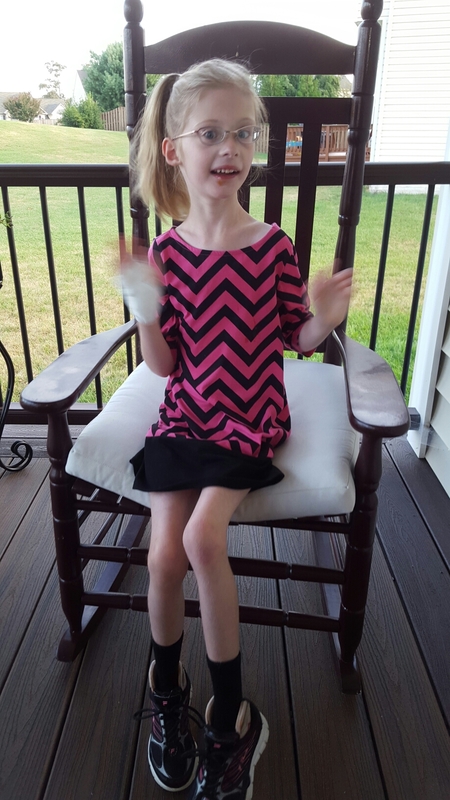 This will help give us a baseline in terms of her myelination progression and how she may progress in the future, including whether we should put her in general or special education, and later go for a diploma or certificate. About two weeks ago I received notification that the test isn’t covered because it’s not at our health insurance’s facility, so we would have to pay 100% out of pocket. This afternoon I mustered up some motivation and energy to call the insurance company to start an appeal process. I explained to the customer care representative the situation and she was careful to ask what the intent of the results of this test were. I explained and then was told that if we were testing for a specific condition, such as Autism, then it would be covered. Because it is being used as an IQ test, it is not covered. I hung up on her. I couldn’t help it. Vivian doesn’t fit into a typical diagnosis. You can’t label her. Unfortunately this means she may miss out on some opportunities that are presented to her, but I will continue to fight. Tomorrow I will call and see if it can be covered under our medical benefit instead of mental health, because she does have a documented medical condition. I’m just so frustrated that I have to continue to validate her unique condition, but she’s worth it. More to come – I have a lot to catch up on. To say it’s been a while is an understatement – I’m not sure where to start! The biggest thing that has happened was that Vivian started walking independently in January. I don’t think she has stopped since! It seemed to come out of the blue – her babysitter was playing with her, trying to get her to take a step to give her a hug. Viv was having fun and didn’t realize that she was taking a step, then two, then three and so on to get to Becca. Her motor planning came together and in typical “V T” (Vivian Time) she was walking on her own. At just over 4 years old, the day so many of us have been waiting for happened. I am a teleworker and happened to be on a conference call when she took her first steps. When Becca came to my door and told me, I promptly excused myself from the call and proceeded to scream and cry and laugh and smile. To this day I still tear up when I tell the story or even think about it. I know I always will, as my daughter’s ability to walk is something I don’t and never will take for granted. There is still much more work to do. She cannot walk up and down the steps independently, she has not yet mastered the art of standing (or sitting down) from the middle of a room. Nonetheless, walking is her favorite thing to do, so she is getting lots of practice in! Joy radiates as she walks, smiles and waves to everyone. If you’re lucky, she may even blow you a kiss. Today you turn four years old! I can’t believe how much you’ve grown. Seriously – you’re almost 4 feet tall – slow down a little! You are of course what I am thankful for today. Every day I wish that life was easier for you. Every day I wonder what your future holds and I try to do whatever I can to make it better. Every day you continue to amaze me, fill my heart with love, and complete my life. There is a good reason I call you “Little Miss”. You’ve developed such a personality without having to say a word. You know how to get what you want, you understand what your daddy and I say to you and you know how to push our buttons! We are constantly amazed at how stubborn you are, but so happy that you have this characteristic. On the flip side, you have one of the sweetest souls ever. Whenever you’re in a shopping cart I can’t stop hugging you because you’re so adorable. You sit there with a big smile on your face and wave to everyone. Some people don’t wave back and I apologize for them. I tell you that hopefully they would have if they had seen you. You reach out and try to touch almost everyone, with the gentlest of hands. Most people don’t mind, and many stop to talk to you. You’re especially fond of waiters and waitresses (your daddy tells them you’re trained to steal tips). You’ve brought smiles to so many people’s faces, without saying a word. Hopefully soon you will start to greet people by saying “Hi”, since we heard you say that for the first time yesterday! You’ve come so far in the past four years and everyone is so proud of you. Please keep it up! You’ve taken some steps by yourself recently, so I know walking is just around the corner. Great things will come in time, little one. Always leave the people wanting more, right? I feel Vivian is just like an infomercial. Whenever you think you have this little one figured out, there’s always a little something more. 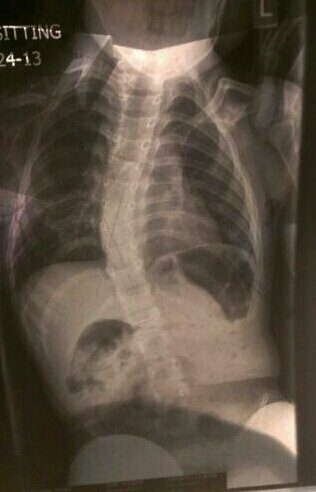 Vivian has scoliosis. 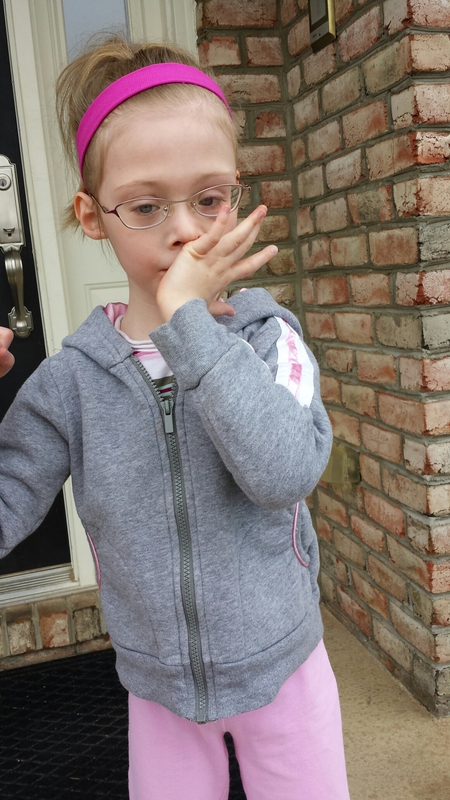 We first learned about it while we were in the emergency room when she had a 105° fever – almost 2 years ago. She was incredibly weak, dehydrated, could barely sit up on her own, and they did a chest x-ray because her pulse oxygen was low. The ER doc comes back with the news. No pneumonia, but she has a severe curve in her spine, we need to get this looked into further, she’ll need to have rods put into her back, but she’ll eventually be fine. As if we weren’t worried enough about her dehydration, we didn’t realize we had come to the ER to hear an orthopedic evaluation. We take the x-rays of her slumped over in the hospital bed to her true orthopedic doctor. After another set, it’s determined that Vivian needs another doctor who specializes in more complex cases. Her curve was definitely not as severe as Mr. ER doc saw, but it was worth concern. Fast forward a year and a half and x-rays with Dr. A show her curve has doubled to 40%. We are then referred to a pediatric orthopedic surgeon. I made the appointment for Friday September 13th. 13 has always been my lucky number, I figured why not! I met the man I had become overwhelmed with emotion about from reading this article. This is her sitting, with Dave and I holding her shoulders as straight as possible. 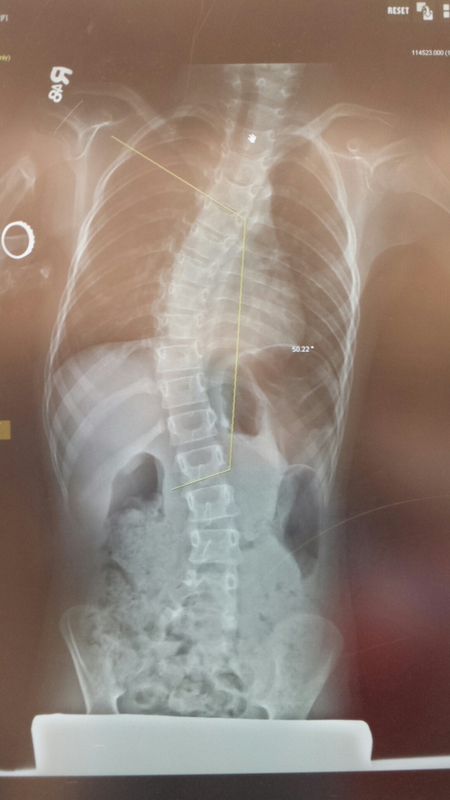 Gina – the optimist’s good news: she doesn’t have to get a back brace! Dave – the realist’s reality check: her curve is at 40% now. When it gets to 50%, she has to get growing rods put in her back, requiring surgery every 6-9 months until she stops growing. We head back in January to check the progress.